Join us for drinks and snacks on-board the Lightship Frying Pan. 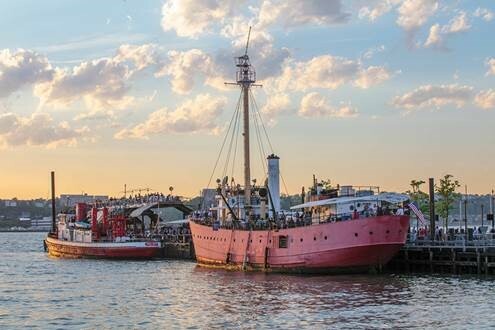 Lightship Frying Pan is a historic vessel permanently docked at Pier 66 Maritime within the Hudson River Park. The vessel was designated a historic site in 1991 and is currently on the National Register of Historic Places. Lightship Frying Pan has led a remarkable life. After being abandoned for 10 years while docked at an old oyster cannery on the Wicomico River in the Chesapeake Bay, we believe she sank due to a broken pipe. She was underwater for three years before being raised by salvors. Instead of going to the scrapyard, the ship was sold to its present owners. After tons of silt and shells were removed from the hull, the ship was outfitted with a new engine and, in 1989, was sailed to New York City. While the outside of the ship has been restored to her original appearance, the inside retains the barnacle-encrusted, sunken-ship motif that acknowledges her storied past. Cost: Platters and some drinks subsidised by MBS. From there the evening will be pay as you go.